Isla’s life at home revolves around the iPad, computer and toys. In the morning she starts off on the iPad upon waking and after breakfast moves to playing with her trains which are a permanent fixture in our lounge. She will need to play with her toys before leaving for school even if it is for a minute before leaving as this is her morning routine and I have learned it’s far easier to give her a minute than trying to say we don’t have time. When she gets home it’s the same thing watching Stampy or a video of trains. Without me actively interrupting and getting her to move on she will stay put all afternoon. She struggles to expand outside her fixed interests on her own even with prompting and loses interest quickly. I would love to have the time and inclination to sit and play games with her. There are only so many times you can play Disney Monopoly without losing your mind!! There is also still dinner to prepare, washing to fold and other children to taxi around. Her sisters, as wonderful as they are, are teenagers now busy with their own lives and activities and homework and don’t have the time or inclination for play much these days. Isla attends art therapy on a Monday and Special Olympics Swimming on a Sunday which she absolutely loves but that leaves many afternoons and weekends where Isla’s free time isn’t spent as I would like it to be. She has a special relationship with her Nana and has many fun times with her but was getting difficult to only have one person to rely upon who knows Isla so well. A couple of years ago we qualified for funding to employ a carer for exactly this reason. At this point (pre Bo) I was so sleep deprived and had no energy to do anything with Isla. The guilt sets in and gnaws away that you should be doing more. More learning opportunities need to be had, steps need to be taken to stop isla turning inward and be part of the world and other people in it. I always wonder if Isla had been born many years ago before this virtual age of iPads and Minecraft what she would be doing with her time. I justify her screen use by rationalising she’s had a busy day at school and can have down time but that feeling I should be investing more time to make up for her delays and deficits is always there. We hired lovely Zali for 5 hours per week. Just to come over and play with Isla. Having some experience with autism she didn’t get offended when Isla would spend the whole time asking “are you going now?” over and over. Isla works well with a visual schedule so we used this to incorporate play, learning and timed iPad breaks into the hours she was here. It took a few months but Isla started asking when Zali was coming and would wait eagerly for her to arrive. 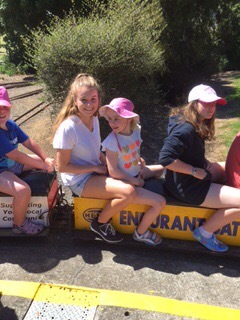 They played many many games of Disney Monopoly, playdoh for hours, Zali was allowed to sit on the mat with the trains when no one else was at that time, they played outside, got messy with paint and went on train trips. 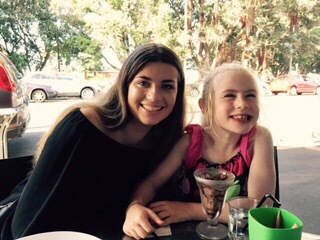 After a year with us Zali left for Melbourne for University but we found a great replacement for her, Olivia, who was already familiar with Isla with our families being friends, and the transition was much easier than I thought it would be. She now has another friend who she loves that comes to play with her and Isla looks forward to her coming each week. There is nothing better than hearing Isla read with Olivia and coming home to seeing them jumping on the trampoline together and playing with Bo. ” Over the last few months I have spent with Isla, I have learnt so much from her, and I hope she has also learnt from me” Olivia says. “I have come to understand and love her little quirks, and I think working with Isla has really shown me a different perspective of how she sees the world. One of the things I especially enjoy is reading with her and hearing how she is improving. Seeing how she explores outside her comfort zone, like when she began to walk to her class by herself, makes me so happy and proud of her. I love my job working with Isla, and it is definitely making me grow as a person, and is hopefully helping her personal growth as well”. I am extremely grateful to have found such wonderful young ladies who are so patient, tolerant and I can see totally get and enjoy Isla. This has been the best thing I have put in place for myself and for Isla. Am sure it has helped her social skills, learning and ability to transition between activities. Hopefully Isla has taught them a thing or two as well and hopefully has enriched their lives as much as they have hers. Thank you so much for sharing, I can completely relate to the guilt you mentioned and this has helped encourage me to employ a friend to come help me a few hours a week and play with my son. Hi there. Where do you live ?? I put an advert on Neighbourly initially and found our first carer and the next one is actually a family friend’s daughter. They are college students. Has been such a help.